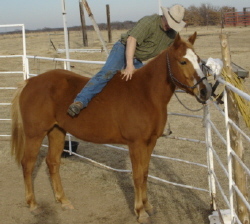 Getting on your horse from the fence can be taught pretty easily. It may take some time but its really neat. When you first got up on the fence and your horse decided to come up to you – it was almost for sure with his head facing you and his body at a 90° angle to the fence. It’s hard to get on one like this unless you can jump high and wide. How do you get him to turn himself broadside to the fence and stay right next to you? You’ll take and just bump the lead rope. (Don’t jerk! Just pull up and give slack – pull up and give slack) this can take some time and you may have to switch hands a few times. If he even thinks about moving forward or sideways, release and reward. Do this a few times and he’ll associate that “bumping” with moving those feet. Make sure your timing is good releasing for the slightest try and pretty soon he’ll be sideways to you. Saddled or unsaddled you can now reach across him and pet his other side. Next reach your foot across and maybe rub him with it on the other side. If the horse has his left side next to you, you’ll reach across to his right side. It won’t be long before you can put weight on his back and eventually just set on him. When you go to set on him (the horses right side is to you) keep your left hand hanging on to the fence and your left foot in contact with it as well. 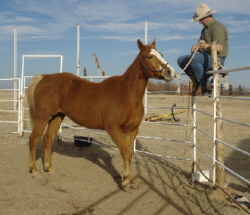 If your horse needs to leave you, just pull back up on to the fence and start over. You can practically get your first ride in with out ever leaving the fence. This gained a lot of value to me when I went to start a 17.2 hand Belgian, and knew I was going to have trouble reaching the stirrup to get on. When getting on your horse from the fence,Always keep track of the slack in your lead rope! If you don’t you can get seriously injured. 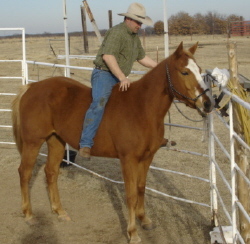 For questions about Getting on your horse from the fence, please contact us.